Are you still there? Updates to the blog have been admittedly slow through January (with the exception, of course, of the weekly movie which I always diligently post) but this is about to change as I’ve been preparing lots of content to satisfy your lust for all things cult. As a matter of fact, we’re starting this week with some lengthy updates. You might want to check out the classic movie being highlighted today along with the classic clip already available in the YouTube channel (approach with caution). Also, in case you haven’t noticed, our Facebook page has surpassed 500 fans over the weekend, which is pretty cool if you ask me. Barely two months after it was announced and this blog is already quite popular! I tremble to think what the future might bring. Seriously, thank you all for your support, it’s really great to have you there… wherever you are. Now for todays update, many hopeless geeks such as yours truly are readying up for the announcement of the mythical Apple Tablet (iSlate? iGuide? iPad?) this Wednesday. I don’t know about you but I’m nervously giggling in anticipation. I honestly think it will change everything in the same way the iPhone did (you naysayers have to admit it already). Why should readers of this blog care, you say? A while ago I was hailing the iPhone/iPod Touch as the platform of excellence for retro-gaming and it kept getting better such as todays post will illustrate. Nobody knows why but it just happened: if you love vintage titles or adventure games, the iPhone has become the only handheld you should consider. Similarly, I predict that the fabled tablet with its allegedly 10” screen size will become an even stronger device to play retro games on the go. My reasoning? It’s about the perfect size for them. While the iPhone has its good share of classic games, it can be admittedly difficult to control some of them with precision. Remember these ports were designed with much larger screens and different interfaces in mind. On the other hand, the 13” size of many netbooks feels right, if a bit too large. I’ve been playing many old games with this size recently and graphics do tend to look blocky and dated. However, even a prehistorical resolution of 320×200 should look reasonably good on 10” screens and still feel comfortable enough to play perfectly fine. Coupled with the soon-to-be-ubiquitous touchscreen and Apple’s friendly app publishing scheme, this will surely mean much more ports. More specifically, I believe the 10” touchscreen will be the ideal way to play past adventures which could mean a full-blown revival of the genre. I’m most definitely excited! Anyway, this part of the update deals with iPhone ports (obviously). 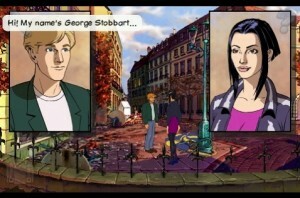 First, and most importantly, is the fresh release of Broken Sword, a game that shouldn’t need any introduction. 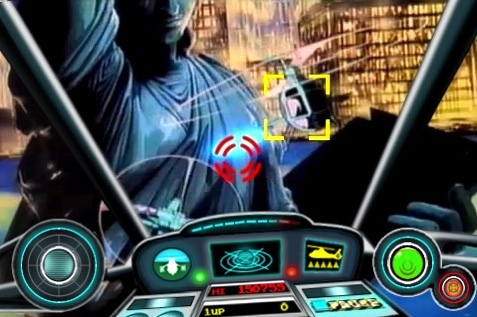 This adventure, Revolution’s follow-up to Beneath A Steel Sky (also available in the App Store), was hugely popular back in 1996 and clearly remains so in the actuality, spawning three sequels, one fan-game and recent Nintendo DS and Wii ports, from which this iPhone version happens to be based on. Broken Sword has been updated with lots of new content (supposedly adding up to 20% of gameplay), new cutscenes and revised graphics. The interface has also been adjusted to feel right on the smaller screen, just as in Beneath A Steel Sky, with great results. Personally I’m not too crazy about the new character portraits but I can live with them. Next on my list is Dragon’s Lair. I don’t believe I need to say anything about the game itself other than it has become an iconic arcade of the 80’s and still is amazingly fun to play these days. Granted, the gameplay is downright dumb but there’s a certain something about Dragon’s Lair that is extremely appealing and satisfying (possibly the notion that you’re truly taking part in a cartoon film). The iPhone port is flawless and the game has never played or seen better – I’m not kidding, the port seems to be a direct conversion of the Bluray release. It just looks drop-dead gorgeous with smooth animations and bright colors. This is clearly a must-have if anything for its nostalgia value. Among the same lines is Cobra Command, yet another laserdisc arcade of the 80’s in which you pilot a battle helicopter through several thrilling situations. 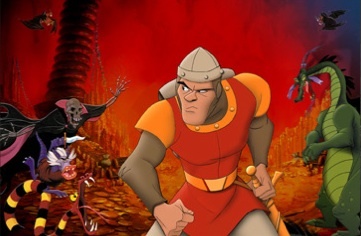 The gameplay was slightly more complicated than Dragon’s Lair, however, since you could steer to avoid obstacles which added a new layer of difficulty. This conversion is also amazing, recreating the same feel of the arcade with extraordinary results. Another recent release that got lost among the waves of apps flowing each week is The Escapee, a very faithful port from one of the last Amiga games ever developed. 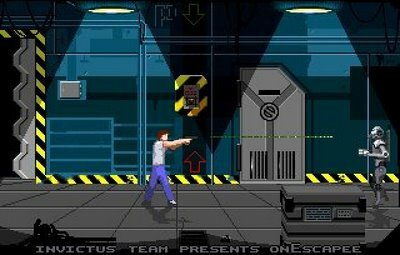 I believe onEscapee (as it was released in 1997) was pretty successful in the Amiga but remains an obscure title everywhere else. This is a very lengthy and well produced game reminiscent of Flashback (alright, to be fair it’s a cheap ripoff) that should be worth your attention. Keep in mind the same game is available for free in the PC, right over here. Finally, the last port worth of mention is the C64 classic rogue game, Sword Of Fargoal. The game has been fully revamped albeit maintaining the same classic look. I had my qualms at first since I never got into rogue games that much but in the end I decided to give it a shot. It’s frankly very addictive and has a lot of casual appeal. 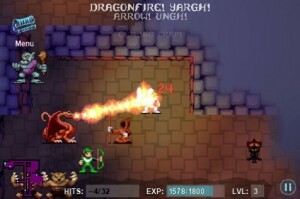 If you never heard about rogue games before, the basic idea is to loot, kill monsters and advance through endless dungeons disregarding any potential storyline. Sword Of Fargoal exceeds in the quick advancing and simple mechanics. Also, the levels are always randomly generated so it will be a long time until you get tired it. More iPhone updates in the second part, coming soon! iTunes Links: Broken Sword: Director’s Cut, Dragon’s Lair, Cobra Command, The Escapee, Sword Of Fargoal. As you may have noticed, this attempt to spontaneously pick a random weekly movie at the very last minute is giving me quite a headache since I’m rarely meeting the Monday deadline. I wanted to turn it into a spur of the moment sort of thing but I’ll have to go the safe route and prepare them in advance. It will be all the same to you but it deeply hurts my pride. But enough lamenting about my limitations, this week we get a fond look back at the movie which taught us that pigs can be very evil creatures, especially the giant ones. Don’t mess with them because they will hunt you, stomp on you and probably eat you – now keep that in mind next time you try anything with ham in it. 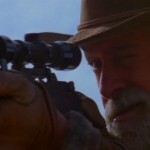 Another week, another movie pick that nearly turns into a review. 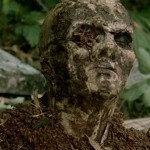 Today we have a lengthy look back at The Resurrected, an excellent film based on a H.P. 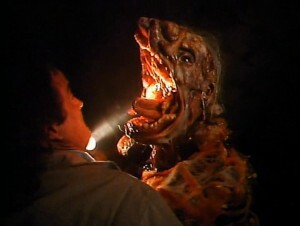 Lovecraft story without Stuart Gordon. No mentioning of Cthulhu either. Heresy? More like a total win! Also, you might want to pay a visit to the fancy YouTube channel in case you missed the latest updates. Some great clips have been uploaded there, if I may say so. Particularly, a snippet from Rituals (we’re still patiently awaiting the DVD release from Code Red) is eerie and unsettling, but there are many other gems as well such as our last movie pick, The Brain (you have to see it to believe it). I would like to take the opportunity to mention some recent crappy news: the demise of Atropos Studios, an adventure game company founded by Alkis Polyrakis, a friend of mine. Alkis is one of the true gurus of the genre, one of those guys that has really been around and is extremely knowledgeable. He first developed one of the undisputed best freeware adventures ever (Other Worlds) and certainly the lengthiest. With Atropos Studios, Alkis produced Diamonds In The Rough which easily became the most unique adventure of recent times. It has to be played to understand why, something that may prove difficult now. Alkis is selling the remaining DITR copies through eBay himself, so you may probably want to have a look if you’re remotely interested. It’s frankly appalling to see such a talented developer being forced to shut down like this, but we can only hope this is just brief pause and Alkis will be eventually back with more original adventures. In other news, I have compiled my top horror movies of 2009, which turned out being a great year for the genre. The list will get probably posted within this week as well. And last, but by no means least, there’s an upcoming review of a very rare and underrated adventure game. Oh yes, we’re off to a great 2010! You are currently browsing the Slightly Deranged blog archives for January, 2010.